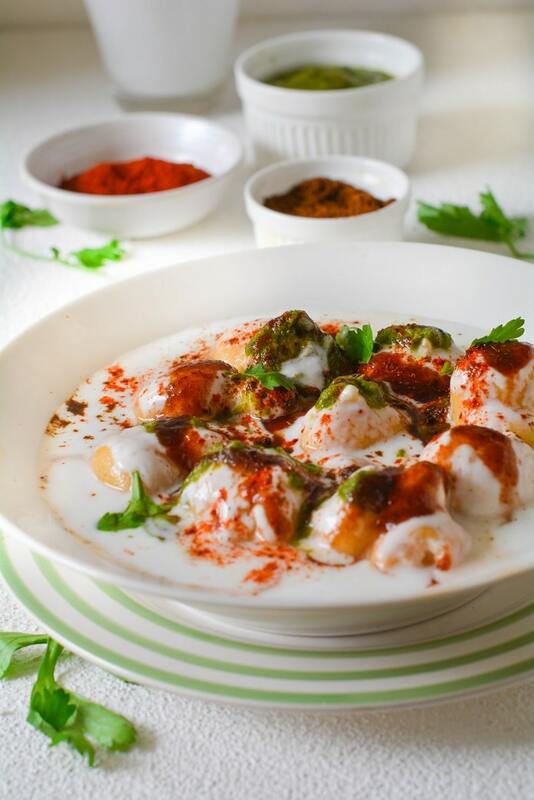 Dahi vada – Fluffy lentil dumplings smothered in creamy yogurt and drizzled with spicy chutneys a North Indian snack/street food. 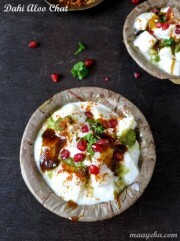 Dahi vada is a very popular snack/chat item of North India. It can be served as a starter, appetizer or as a side dish.The wonderful rich and creamy taste of dahi vada makes it on the top list of Indian chat. 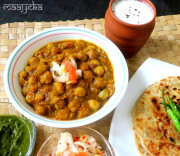 It is also a delicious street food of Northern India. South India’s famous Thayir Vadai is very close to dahi vada – just the shape and the spices used to garnish are different, and usually thayir vadai doesn’t have chutneys drizzled over it. 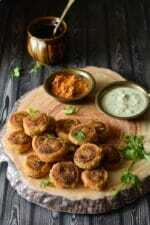 Dahi vadas are round fritters made with husked white lentil/urad daal. Daal is soaked and ground into soft paste and then whisked well to make it fluffy. 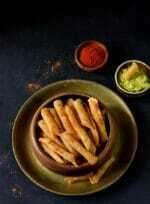 Small nuggets from the whisked daal are drooped in hot oil either with wet spoon or using your fingers. 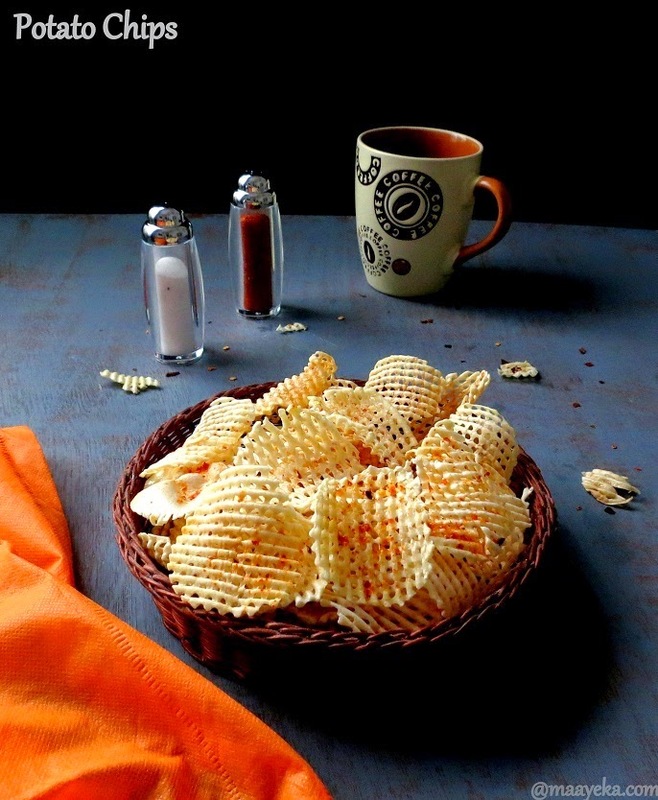 They are deep fried to a golden colour and then soaked in salted water. When they are soaked well for about 1-2 hours take out,squeeze gently and then drizzle with yogurt, tangy sauces, chili powder and roasted cumin powder. Dahi vada are usually made with urad daal or you can also mix little yellow moong daal in it, it depends on personal preference ,both taste good. first is to use good quality Urad daal,very old stock may not give best results. Soak the daal for minimum 6 hours or preferably overnight. Grind the soaked daal to make a smooth batter,you have to add just enough water while grinding as very little water won’t make it soft and fluffy and adding too much water make it watery and then it become difficult to shape and and it will also absorb a lot of oil. 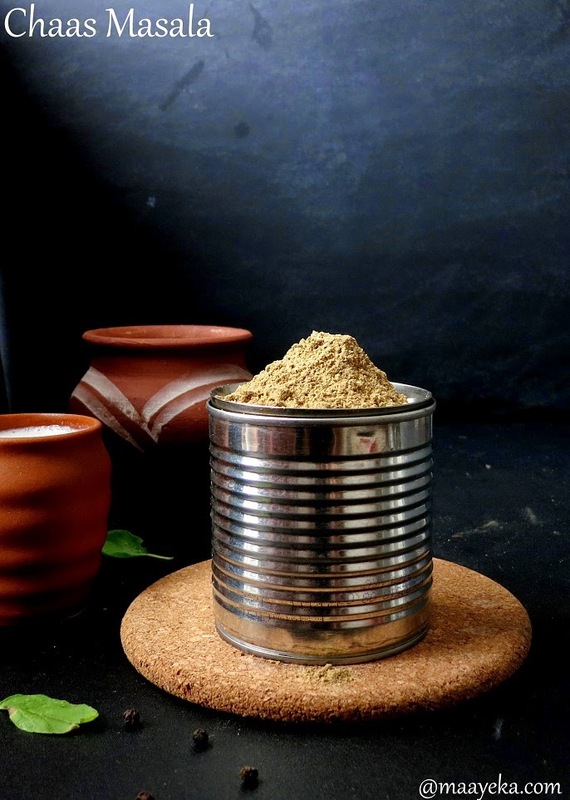 After grinding the daal, it should be whisked very well with a spoon, fork or with a wire whisk to make it fluffy ,the whisked daal will change its colour from cream to white and look fluffy when done. You can check if it is done or not by adding a drop of batter in a bowl filled with water, if the drop floats on top then its done and if it sink in then you need to whisk it more. 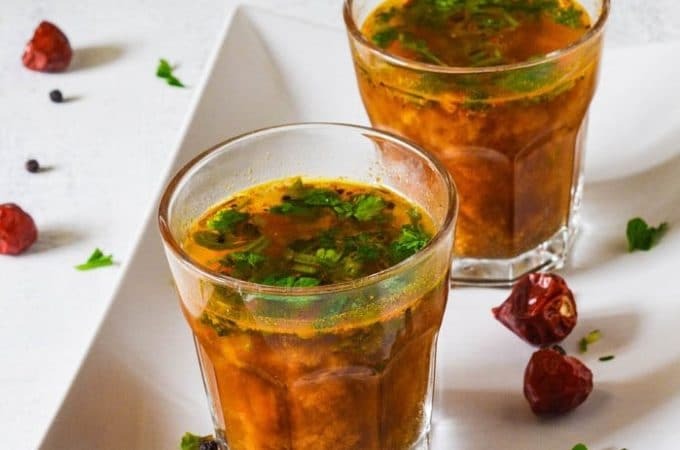 If you have whisked the daal well then there will be no need to add soda bi carb in it ,I have never used soda and get super soft vadas every time. 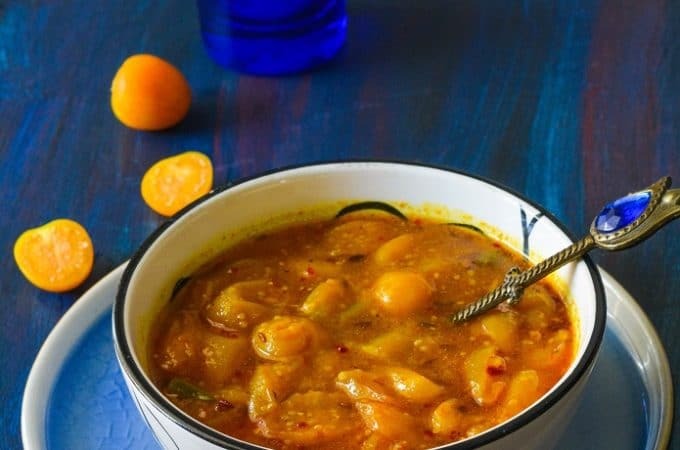 At this stage you can add few chopped cashews, raisins, crushed pepper,fennel or cumin seeds, chopped ginger, chopped green chilies in it ,but this is optional you can add just few things or make them plain if you wish. 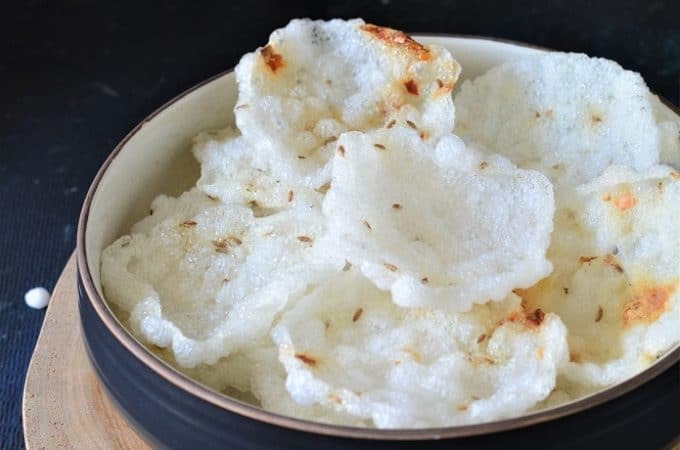 After you have whisked the batter well then deep fry the dahi vadas on medium heat ,if you fry on high heat then they will cook from the outside but may remain raw from the inside ,and if you fry them on low heat then the dahi vadas will absorb lots of oil. You can make dahivada’s small or big any size of your choice. 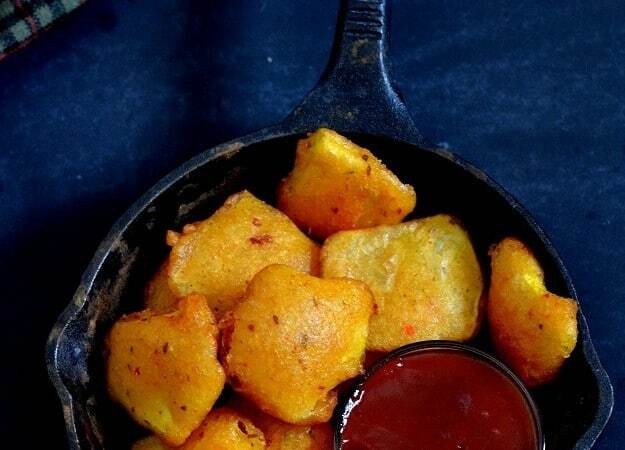 You can definitely freeze fried Dahi vada’s and use them later. Deep Fry dahi vada’s and then let them cool down completely and then store in a zip lock bag and keep in your freezer . They stay fresh for at least 2 months. When you want to use them then just take out from the freezer and let them defrost and come to room temperature . Then add salt in medium hot water and soak the vada’s for few hours or till they become soft. Then add yogurt, chutney’s and spices. Drizzle with chilled sweet yogurt, Date and tamarind chutney, Green chutney, sprinkle black salt, red chili powder, roasted cumin powder and some chopped fresh coriander. Refrigerate for an hour and then serve chilled dahi vadas. done ,but if it sinks in the bottom then you need to whisk the paste some more. Deep fry in enough oil on medium heat from both sides till golden in colour. Soak the vadas in water with some salt added. Sprinkle roasted cumin powder,chili powder and black salt and some tamarind chutney and mint chutney. Dahi vada -Fluffy lentil dumplings smothered in creamy yogurt and drizzled with spicy chutneys a North Indian snack/street food. 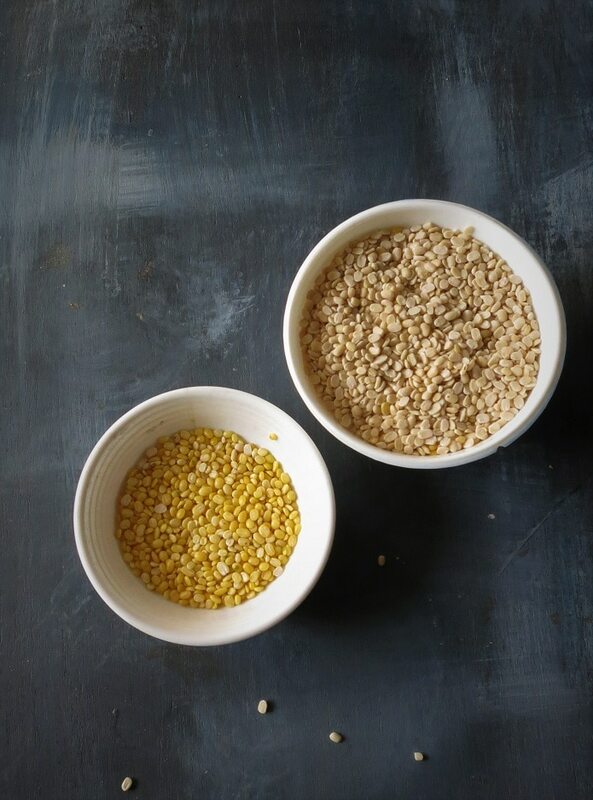 Wash and soak both the lentils together in sufficient water for a minimum of 6 hours. 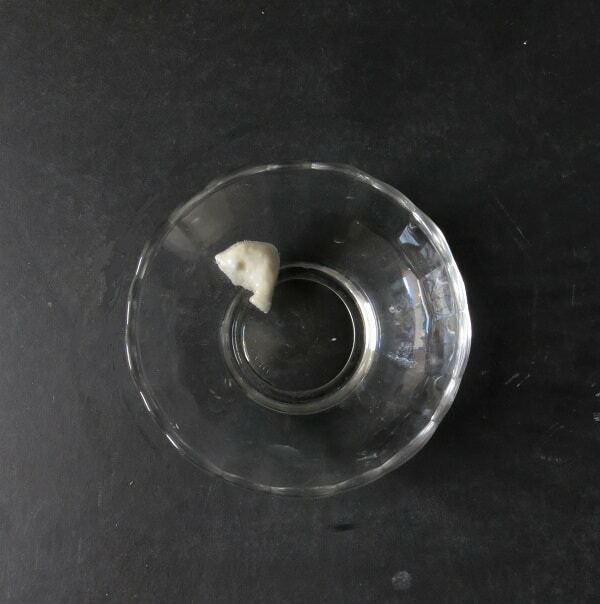 now drain the water and Wash them again and grind to make a smooth paste. 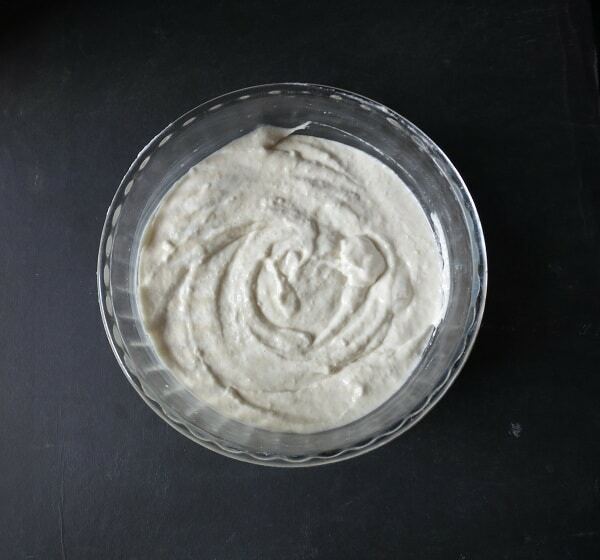 Whisk the ground lentil paste well to make it fluffy. To check if its fluffy enough - drop a small ball of batter in a cup of water,if it floats over it ,then it's done ,but if it sinks in the bottom then you need to whisk the paste some more. 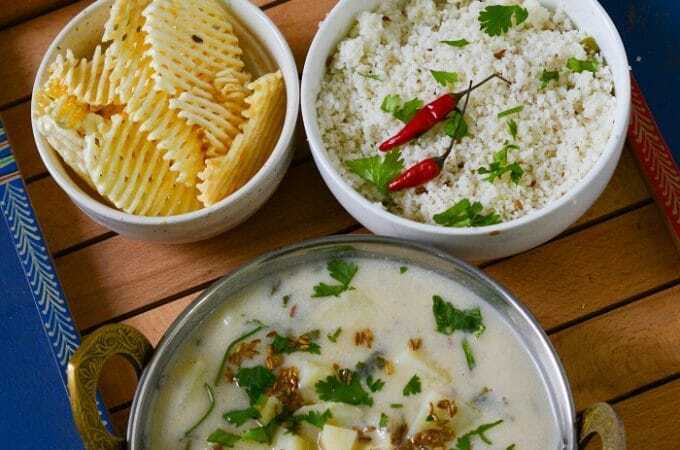 When the paste has been whisked enough, add chopped ginger, chopped fresh coriander,green chilies, crushed pepper corns, cumin seed or Fennel seed, raisins and cashew nut pieces in it and mix again. Heat enough oil in a big ,wide deep pan . Dip your fingers in water and take small portions of the batter in your hand and drop small balls of it in the hot oil OR take the mixture in a wet spoon and drop it gently in the oil. 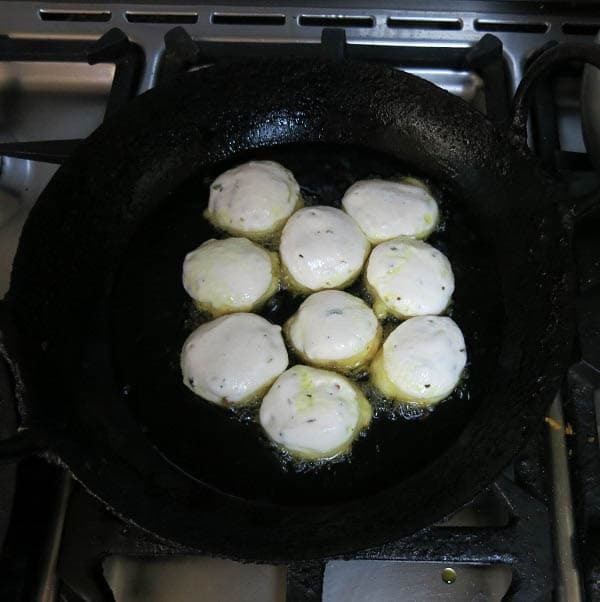 Make 4-5 vadas at a time ,don't over crowd the pan else you have difficulty while turning the sides. Deep fry them to a nice golden colour on medium heat. Drain and keep aside. 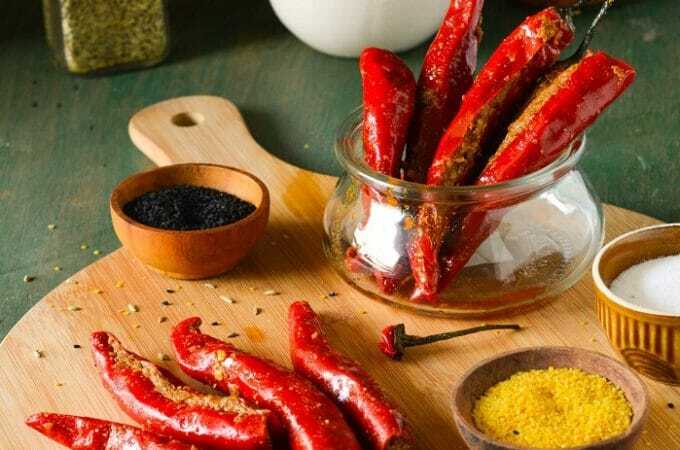 Take approx 4 glasses of water (at room temperature)in a big bowl and add 1 tsp of salt and 1/2 tsp chili powder to it and mix. Now add all the fried vadas in the salted water, cover and let them soak for 1 hour or till they become soft. When the vadas are soaked well and looks fluffy and soft, take them out from the water, gently squeeze between your palm and put into the serving plate. 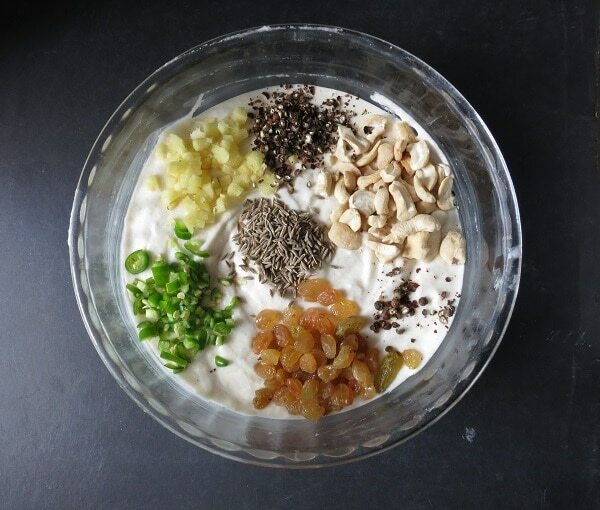 Take chilled yogurt in a bowl and whisk well, add water to adjust the consistency,add 2 tbsp sugar, salt and 1/3 tsp black salt and mix well. Drizzle yogurt, date chutney and green chutney on the vadas. Sprinkle roasted cumin powder, black salt and chili powder on the vadas. Chili in the refrigerator and serve after some time. 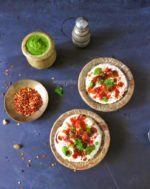 1-You can made dahi vada just with white lentils (urad daal), addition of moong daal is optional. 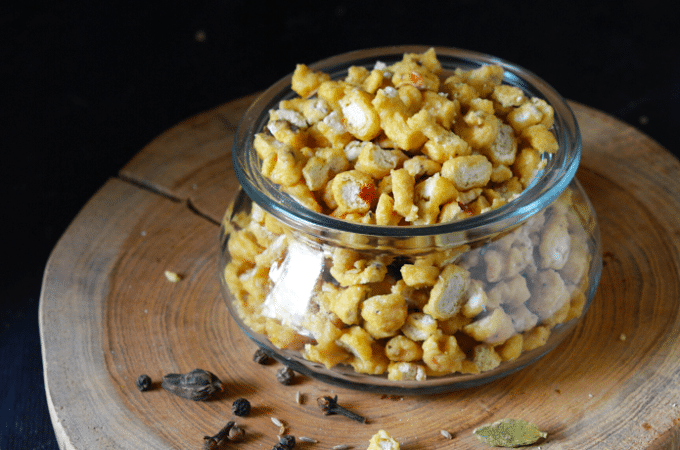 2- Addition of ginger, raisins , green chilies, pepper corns and cashews are optional. 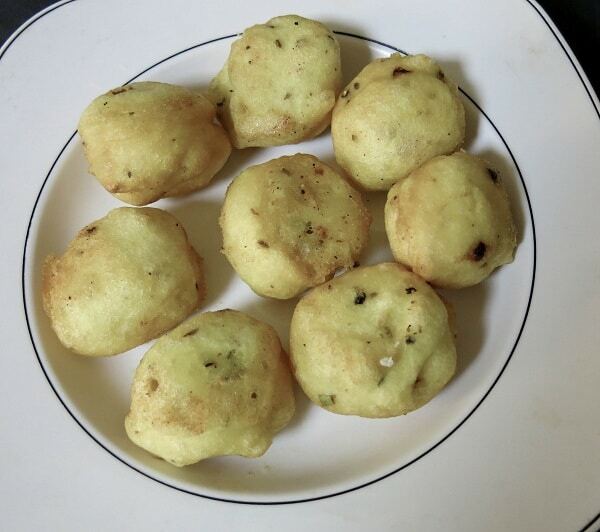 3-You have to beat the batter well to make soft vadas. 4-Fry them on medium heat - if you fry on high heat then they will remain uncooked from inside and if you cook on low heat, then they will absorb too much oil and may become hard. These look absolutely delicious. I love this blog I come to it regularly for simple, home made, healthy dishes I can’t find elsewhere. How many servings does this make? I think the blog had them but seem to be missing from this post. 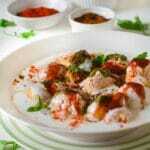 My all time favourite, droolworthy dahi vadas, wish i get some. I have always loved your presentations 🙂 and dahi vada is such a fav! Hi Anjanaji, Whenever we eat out I always order Dahi wada. Now I will try your yummy recipe at home. Thank you. Looks very soft. Childrens Fav. 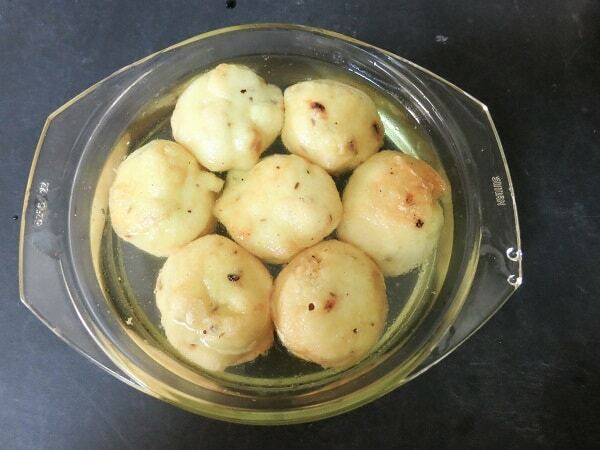 mine were simple ones with no extra additions.. though i tend to add slight sugar in curd.